Your company is turning in regular profits every year, and its market share is only getting bigger. Competitors can't touch you. So why is your stock price so sluggish? The answer is as simple as it is cruel: investors aren't interested in history, and they already know you're profitable and competitive-that knowledge is baked into your stock price. The hard reality is that a competitive advantage just isn't enough. Investors want companies to surprise them with unexpected value, which means that you can outperform market expectations only if you as a leader know how to find, create, and deliver a series of multiple competitive advantages. This is why a corporate theory is so important. A good corporate theory provides a compass for those at the strategic helm, guiding their decisions about what assets and activities to pursue, what investments to make, and what strategies to adopt. Behind every long-term corporate success story lies a basic theory about how that company creates value. 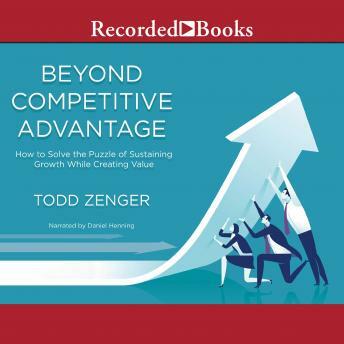 In Beyond Competitive Advantage, strategy professor Todd Zenger describes what makes a great corporate theory and helps readers understand the many tensions and trade-offs they'll face as they apply the theory to meet the challenge of market expectations. Based on years of research and analysis, Beyond Competitive Advantage provides managers and executives with a framework for both sustaining value and creating growth.